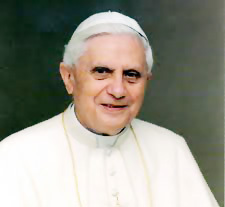 Cardinal Joseph Ratzinger is elected as Pope on Apr. 19, 2005 - the new head of the world's 1.1 billion Roman Catholics. Joseph Ratzinger was born April 16, 1927, in Germany. He was ordained a priest June 29, 1951. A towering intellectual, a deeply holy man, a kind hearted and strong in his beliefs, he has been one of the closest confidants of Pope John Paul II.